It is no secret that crappie love hidden structure. Why else would anglers spend so much time making and adding structure to bodies of water for their “honey holes”? Adding structure to a lake is a proven way to increase your catch limits, but there are countless other natural structures that will do the same. Drop offs, creek channels and stumps are just a few of the hidden features that will hold crappie. To find these features you have to rely on your sonar, but there is another and possibly better way. 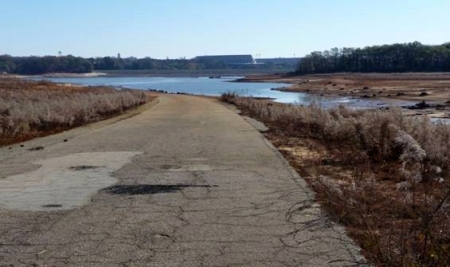 Nobody likes a drought, especially fisherman when it comes to their lakes drying up. However, this is an excellent time to go out and find natural structure that you may have never known existed. With the levels dropping to record lows on my home lake, objects are literally popping up everywhere. I remember my dad telling me about a stand of trees just out from our dock, but never realized how many there were until last year when the lake dropped. Instantly, in my head, I had a new fishing spot. To find more of these hidden features would require riding the lake. Fortunately, the Corp. has been adding gravel to the boat ramps to keep them somewhat operational. The first areas that I noticed were all the long points extending into the lake.Crappie will use these points as “staging areas”, during the early spring as they move from their deep main lake winter holding areas, especially if the point has any brush, stumps or rock piles on it. 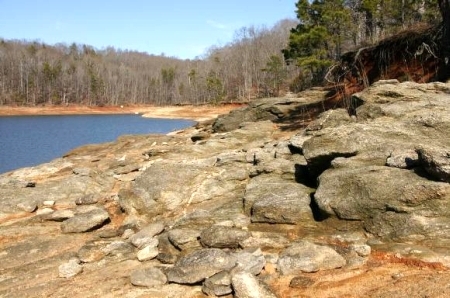 Rock piles will absorb solar heat and cause the surrounding water to warm sooner during the springtime. Slightly stained water that is also filled with wood and rocks will heat up much quicker than a bank that is barren. Often overlooked, road beds can produce quality fish. There will be gravel and rock where the road was along with brush and ditches. The best roadbeds are those that are close to the river channel. Where there is a road there may also be a bridge. During the hot summer months, the shade underneath the bridge will provide cooler water for fish to hang out in. 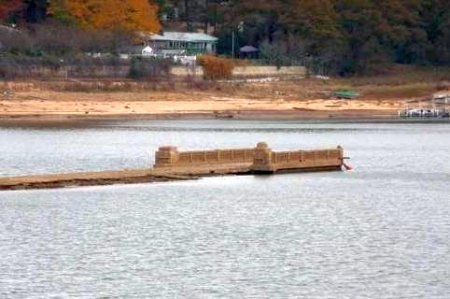 One technique to try on submerged bridges is to anchor on the upstream side of the bridge. Using a slip bobber set to a depth that will be lower than the bridge. Allow the bait to float towards the bridge and as it approaches the bridge the crappie will come out from under their hideout for a quick snack. Dock shooting is a technique that is growing in popularity. 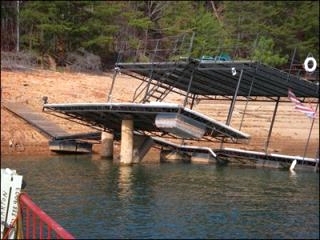 The best docks to use this technique are those with some type of structure underneath them. If it were not for lower lake levels, one may never know what lies beneath a certain dock. There are too many areas that will show up during times of low lake levels to try and remember without some sort of record keeping. At the very minimum, one could mark these areas on a map, but why stop there? Numbering the areas on a map and keeping a notebook with certain details about each area will be more beneficial. For those with GPS capabilities, you can get out of the boat and mark a waypoint directly on the structure. Taking photos of the areas and keeping notes may also be another way to jog ones memory in the future about the location and structure of possible hotspots. Camcorders are another tool to use. While you video the area, make verbal notes about what you see. I cannot in good conscience, suggest going out on a lake that is lower than normal without making a statement about safety. The very things that we are looking for are, in essence, HAZARDS. Familiarize yourself with the waters that you will be fishing, before and during the trip, with a good topographical map of the area. At the very least, keep the speeds low, use your sonar to watch the depth and keep the kill switch tethered to you. 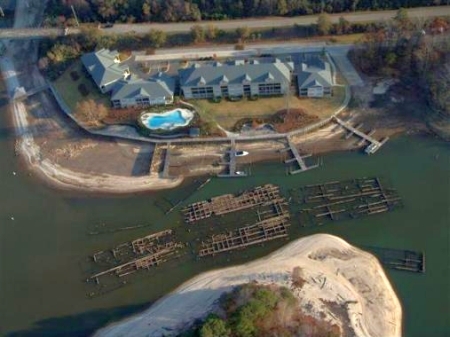 The bridge pictured in this article laid largely forgotten, until the mid 80’s when drought conditions caused the lake to drop so far below full pool that boaters began tearing out their bottoms on the reappearing concrete bridge. Taking the time to learn what lies beneath the surface will not only make you a better fisherman, but also a better boater. With all the knowledge gained from your “research”, all that will be needed to prove your new “honey hole” is the rain. 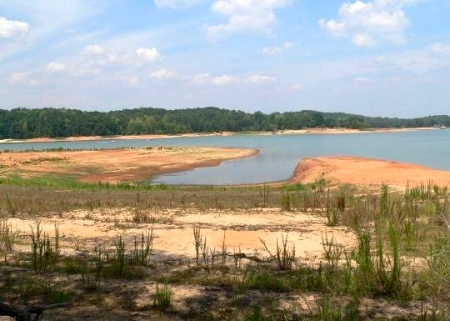 So if your lake is drought stricken, get out and learn the lake. Who knows what you may find.